But that doesn’t mean he was wild about ALL the words that wound up in the final product. Johnson wrote “A Game of Pool” with a different ending. In his original draft, Winters, as the late billiards great Fats Brown, wins the game. 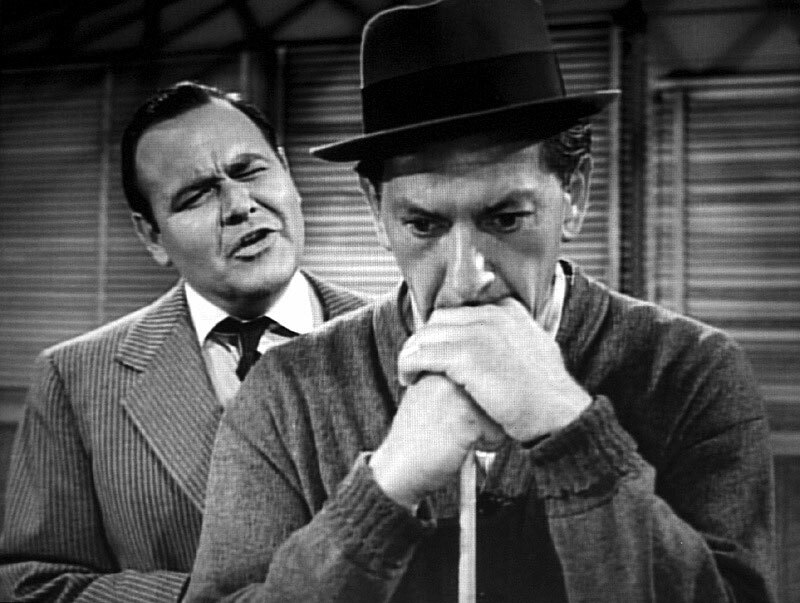 Klugman, the determined, long-practicing Jesse Cardiff, is left frustrated. He yells at the retreating figure of Fats, swearing that he’ll keep practicing — that he’ll do anything it takes to beat him someday. 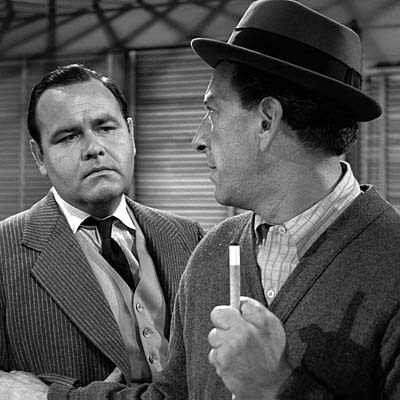 But Serling wanted it to end with Jesse winning. And as Zone fans know, that’s the ending we have today. Johnson wasn’t happy about that. He always maintained that his original ending was better. He finally got a chance to see it filmed that way in the 1980s, when the Zone was revived as a series for the first time. Was he correct? With apologies to a great writer, I don’t think so. The ending as we have it is best. Yes, it’s easy to say that because a) it’s tempting, as a Zone fan, to yield to Serling’s judgment, and b) we’re biased by having always seen the show with Serling’s preferred ending. But it’s more than that, I believe. Simply put, “A Game of Pool” as we have it is more of a true Twilight Zone. Johnson’s ending lacks any kind of twist. A champion is challenged, he gives battle, he wins. The only thing making it Zone-like would be Fats materializing from limbo to make his appearance. But with Serling’s ending, it becomes a be-careful-what-you-wish-for story, which always proved well-suited to the fate-filled Zone universe. Take what may be the most famous Twilight Zone, “Time Enough at Last.” Burgess Meredith plays a myopic book-lover who wants nothing but time. He gets it — much to his ever-lasting regret. In “A Game of Pool,” Jesse, too, gets his life-long wish. He beats Fats and becomes the world’s best pool player. Little did he realize it will carry a price: future would-be champs will summon him to pool halls all over and force him to defend his title — indefinitely. This can’t help but elicit a wry smile or chuckle from viewers the first time they see this episode. “I have been told that it is considered one of the best of the series,” Winters said. Whichever ending you prefer, we can all agree on that. For a daily dose of Serling, I hope you’ll consider following me on Twitter. On Facebook or Pinterest? Me too. You can also sign up for email notifications of future blog posts by clicking the “follow” button in the upper left-hand corner of this page. Hope to see you in some corner of the fifth dimension soon. 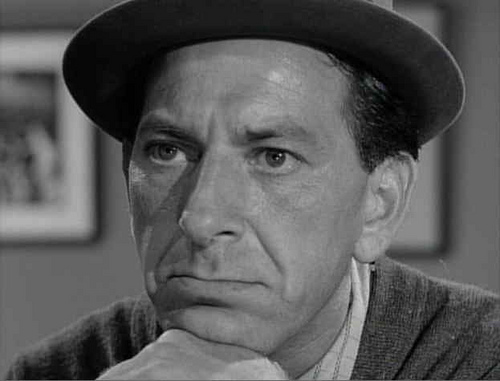 Posted on 11/07/2011, in Twilight Zone and tagged George Clayton Johnson, Jack Klugman, Jonathan Winters, Rod Serling, Twilight Zone. Bookmark the permalink. 16 Comments. I do agree, though, that, either way, this is one of the best episodes of the series. Two fantastic performances in the service of one great script. True. I didn’t mean to imply that a TZ HAS to have a twist ending. But many episodes did, and Serling and the other writers often tried for one. “Steel,” of course, has no twist, but I would argue that “Where Is Everybody?” does: finding out that it’s all a sensory-deprivation experiment. The story lacks a supernatural element, yes, but it has a twist. Johnson’s original ending to “A Game of Pool” might have, as you say, preserved a certain ambiguity, but I don’t think it would have been as satisfying. The possibility of the whole thing being just a dream, in fact, is pretty hackneyed. That could even have been what motivated Serling to change it. If I ever saw that reworked episode, I don’t remember it, so I can’t “judge” as to which turned out better, but I do really like the offiicially aired one. It definitely has some good depth to it, and is one of the best episodes. It also has some real, earthly, consequences to it. Great post, Paul! But you did a fantastic job on this post though. And I couldn’t agree with you more about the ending. Johnson’s original is, quite frankly, lack-luster and boring. As you said, no twist, nothing clever, no moral, just a … story. And that’s not what the Twilight Zone was about. It’s not what Rod Serling’s vision was either. So like you, I’m very grateful that we have the ending we do. So much more poignant and memorable. And THAT is very TZ. Thanks! I’m glad this post appealed despite the fact that you don’t care much for the episode. It’s interesting to see how Serling helped make the story fit in better with the fifth dimension. “Be careful what you wish for,” after all, is pure TZ! I do agree that it’s a great episode and the ending we have is the better ending. I never saw the alternative ending. Was the story altered or did Jesse die as well? I like the fact that Jesse is such a sad-sack character. I think that if he lost, he probably would have wanted to die. I like that he gets his wish and eventually realizes that it was more than he bargained for. Me too. Makes it much more TZ-like, I think. Getting what you wanted, and finding out that it’s not what you counted on, is par for the fifth dimension. As for the alternate ending, it’s been a while since I’ve seen it, but it was simply what GCJ wanted: the same story, but Fats wins, and Jesse is left raging that he’ll practice night and day and eventually beat him.